If you don't have the right gear for the course you are booked on with Alpha Mountaineering you can either hire it from me or I can help arrange hire for you. On this page you will find the hire costs for some equipment I can provide. You will need your own personal equipment for the days on the hill. 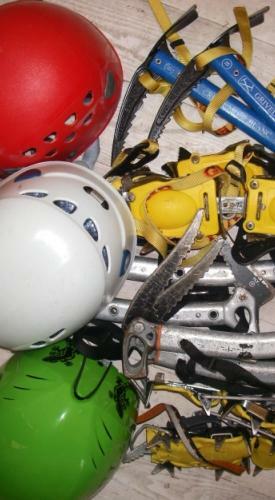 This includes waterproofs, boots, rucsac, helmet, harness and crampons and ice axes in winter. Check to see exactly what you will need by going to either the Summer Equipment Page or the Winter Equipment Page. If you are unsure that the gear you have is suitable or you need to hire something not listed below please get in touch for a chat. Have a look at what previous clients have had to say about Alpha Mountaineering on our Client Feedback page. To learn more about our prices and terms and conditions have a look at our Booking page. If you have any questions about anything on this page please get in touch. Contact details are on the Contact page. To find out the recent conditions on the hills and what we've been up to at Alpha Mountaineering then go to our News and Conditions page. When booking a course with Alpha Mountaineering you will need to provide your own personal equipment for the days on the hill. This includes waterproofs, boots, rucsac, helmet, harness and crampons and ice axes in winter. If you don't have the right gear I can either hire it to you or arrange to get it hired. The table below shows how much it costs to hire gear from me. If you need to hire something not mentioned in the table below please get in touch.